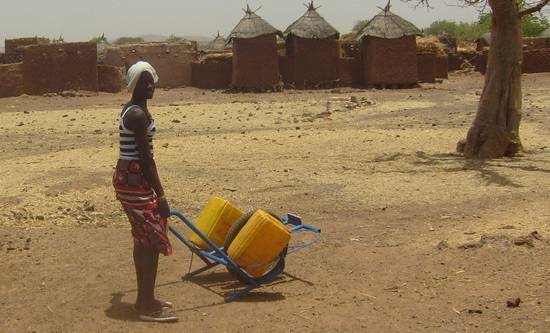 Thanks to simple barrows the women of Ninigui suffer less while fetching water every day. A single barrow can carry up to four jerrycans at once. Mathieu is not only farmer, facilitator for Ocades and catechist in the village of Barga, but he is also sourcier or dowser. With his divining rod he looks for water. 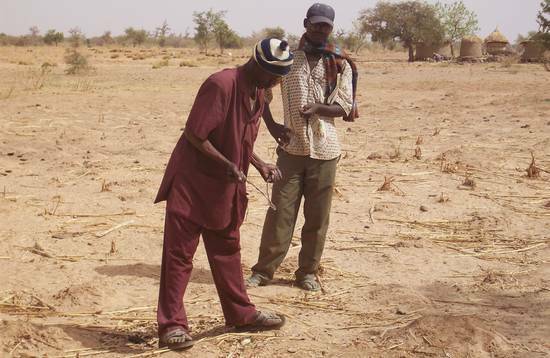 When we want to dig a well, we rely upon his services: he tells us exactly where we can find water, and informs us about the depth of the water, its flow and the composition of the superior soil layers. During a training session for onion and tomato processing, women from the village Noungou learn how to make ketchup. Here they are turning the tomatoes through the hand-mill. Locally produced ketchup only costs half as much as the imported Lebanese one, and it's taste is even better. Just ask the women of Noungou. Yassia, our boutiquier. His small shop is near our house, and he sells about everything: fresh bread, beauty milk, sardines, flip-flops, and even local rice.